The PZL P.11 was a Polish fighter aircraft, designed in the early 1930s by PZL in Warsaw. It was briefly considered to be the most advanced fighter aircraft design in the world. The PZL P.11 served as Poland's primary fighter defence in the Polish campaign of 1939, but by that point was outdated due to rapid advances in aircraft design. 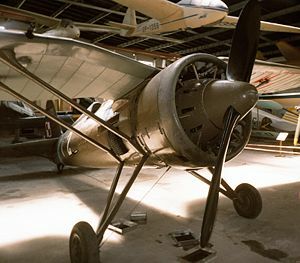 The history of the PZL P.11 started in 1929, when a talented designer, Zygmunt Puławski, designed an all-metal, metal-covered monoplane fighter. While most of the world's forces were still using biplanes, the new P.1 used a high-mounted gull wing to give the pilot an excellent view. A second prototype, the P.6, was completed the next year. The design generated intense interest around the world, the layout becoming known as the "Polish wing" or "Puławski wing". A further improvement, the PZL P.7, was built for the Polish Air Force in a series of 150. After designing the P.7, Puławski started further variants with larger engines, leading eventually to the P.11. The first P.11/I prototype flew in August 1931, after Puławski's death in an air crash. It was followed by two slightly modified prototypes, the P.11/III and the P.11/III. The first variant ordered by the Polish Air Force was the P.11a, considered an interim model and built in a series of 30. Otherwise similar to the P.7, it mounted the 575 hp (429 kW) Bristol Mercury IV S2 radial engine produced in Poland under licence. The final variant for the Polish air force, the P.11c had a new, refined fuselage, with the engine lowered in the nose to give the pilot a better view. The central part of the wings was also modified. Production of the P.11c started in 1934 and 175 were produced. The first series of approximately 50 P.11c aircraft were fitted with Mercury V S2 of 600 hp (447 kW), the rest with Mercury VI S2 of 630 hp (470 kW). Such limited production may appear irresponsible on the part of the Polish government, with the Red Army aviation reaching into thousands and Germany ramping up production at an unprecedented scale. Even without the new WP2 plant at Mielec, the PZL works could produce at least 10 fighters every month. However, the Lotnictwo Wojskowe (Military Aviation) command was still studying different concepts of the use of fighters and bombers, while the Polish design bureaus were developing very advanced designs. The untimely death of Zygmunt Puławski also complicated the matter. Apart from Poland, Romania showed interest in the new design. Even before the P.11a, 50 aircraft designated P.11b were produced for the Romanian Air Force and delivered in 1932. They were fitted with Gnome-Rhone 9Krsd Mistral 595 hp (444 kW) engines, otherwise they were similar to the P.11a. After the P.11c had been developed, the Romanians decided to buy a licence and produce the new model at the IAR factory. As a result, from 1936 IAR built 70 aircraft as the IAR P.11f with the slightly updated 9Krse of 610 hp (450 kW). The Romanians then produced another Polish fighter, the PZL P.24, developed from the P.11 exclusively for export. Some other countries were interested in buying the P.11, but finally Bulgaria, Greece and Turkey bought the P.24 instead. When the P.11 entered service in 1934 it was arguably the most advanced fighter in the world. However, due to the quick progress in aircraft technology, they were obsolete by 1939, overtaken by cantilever designs with retractable landing gear such as the Soviet Polikarpov I-16 and German Bf-109. Unfortunately, it remained the only Polish fighter in service, totalling about 185 examples, distributed within six air regiments and the aviation school in Deblin. Although aware that the P.11 was outdated, the Polish Air Force had pinned their hopes on the new PZL.50 Jastrząb, which suffered extended delays. When it became apparent that the PZL.50 would not be in widespread service in time for a war that was clearly looming, consideration was given to producing an updated P.11 version with the 840 hp (626 kW) Mercury VIII and an enclosed cockpit, known as the P.11g Kobuz. Only the prototype of the P.11g with a maximum speed increase to a still-slow 390 km/h (~240 mph) was flown before the war, in August 1939. In light of the unavailability of PZL.50, the only hope of replacing the obsolete P.11 lay in acquiring modern fighters from abroad. In 1939, after receiving the necessary credits, Poland ordered from France 120 Morane-Saulnier M.S.406, and from Britain 14 Hurricane I, plus one Spitfire I for testing, in addition to 100 Fairey Battle light bombers. None of these planes were delivered to Poland before September 1939. The aircraft was conventional in layout, with high wings, all-metal, metal-covered. The cockpit was open. An internal fuel tank in a hull could be dropped in case of fire emergency. The armament was two 7.92 mm machineguns on hull sides, though a third of the P.11cs had two additional machine guns in the wings. The P.11c could carry four small 12.5 kg bombs (P.11a could not). The radial engines used were: P.11a: Bristol Mercury IV S2 (normal: 525 hp (391 kW), maximum: 575 hp); P.11b: Gnome-Rhone 9Krsd (550 hp, max: 595 hp), P.11c: Bristol Mercury V S2 (565 hp, max: 600 hp) or Mercury VI S2 (590 hp, max: 630 hp), P.11f: Gnome-Rhone 9Krse (560 hp, max: 610 hp). At the outbreak of the Second World War, on 1 September 1939, the Polish Air Force had 109 PZL P.11cs, 20 P.11as and 30 P.7as in combat units. A further 43 P.11c aircraft were in reserve or undergoing repairs. Only a third of P.11c were armed with four machine guns, the rest had only two, even fewer had a radio. The P.11 were used in 12 squadrons, each with 10 aircraft (two squadrons constituted a group, in Polish: dywizjon). Two groups - four squadrons - were in the Pursuit Brigade deployed around Warsaw, the rest were assigned to Armies. All of them took part in defense during the Invasion of Poland. Apart from combat units, several P.11 aircraft, including a prototype P.11g, were used in improvised units at air bases. By 1 September 1939, the fighter squadrons had been deployed to remote airfields, so they were not bombed by the Germans. During the Polish campaign, the P.11 fought against more modern German bombers and fighters. Not only were the German Messerschmitt Bf 109 and Bf 110 faster and better armed, but also most German bombers were faster. Since the P.11 fighters had seen years of intensive use before the war, their maximum speed was even lower than the theoretical 375 km/h. The P.11a were in an even worse condition. Another serious deficiency was their small number which meant that missions involving groups larger than about 20 aircraft were rarely undertaken and reserve machines were practically unavailable. On the other hand, the Polish fighter aircraft had better manoeuvrability and because of their design, had much better vision from the cockpit than the German aircraft. The P.11 had a strong construction, good rate of climb and could operate from short fields, even rough ones. It was also of a very durable construction and could dive at up to 600 km/h without risk of the wings falling apart. Theoretically the only limit in manoeuvres was the pilot's ability to sustain high g forces. Despite the German superiority, the P.11 managed to shoot down a considerable number of German aircraft, including fighters, but suffered heavy losses as well. The exact numbers are not fully verified. A total of 285 German aircraft were lost according to Luftwaffe records, with at least 110 victories credited to the P.11 for the loss of about 100 of their own. Some of the German aircraft shot down were later recovered and put back into service. That allowed German propaganda to claim smaller combat losses. At dawn on 1 September, Capt. Mieczysław Medwecki flying a PZL P.11c was shot down by Rottenfx�hrer (Foreman Leader) Leutnant Frank Neubert of I./StG 2 (Stuka) , having the dubious honour of becoming the first aircraft shot down in the Second World War. The first Allied air victory was achieved 20 minutes later by Medwecki's wingman, Wladyslaw Gnys who shot down two Dornier Do 17s with his P.11c. The PZL P.11c was also the first aircraft to successfully ram an enemy aircraft in the Second World War. The first large air battle of the Second World War took place in the early morning of 1 September over the village of Nieporęt just north of Warsaw, when a German bomber group of about 70 Heinkel He 111 and Dornier Do 17 was intercepted by some 20 P.11 and 10 P.7 fighters and had to abandon their mission to Warsaw. Most of the P.11s were destroyed in 1939, though 36 were flown to Romania and taken over by the Romanian Air Force. Due to their obsolescence, these veteran aircraft were not used in combat; only a small number was used for training while the rest were dismantled for spare parts. Some aircraft were used by the Germans for training. Two PZL P.11s were captured by the Red Army and used for testing. One landed in Hungary (near the town of Hajdx�bx�szx�rm�ny) and was used as a glider towing plane by the University of Technology in Budapest. The sole surviving P.11c aircraft is on display in the Polish Aviation Museum in Krakx�w. Hungarian Air Force operated one ex-Polish Air Force PZL P.11a evacuated on 23 September 1939. Latvian Air Force operated one ex-Polish Air Force PZL P.11a evacuated on 17 September 1939. Soviet Air Force took over the Latvian machine when they invaded Latvia 17 June 1940, and two more (see above) as war prizes. Hooton, E.R. Luftwaffe at War; Blitzkrieg in the West: 1939-1940, Volume 2. London: Midland Publishing, 2007. ISBN 1-85780-272-1. Hooton, E.R. Luftwaffe at War: Gathering Storm 1933-1939, Volume 1. London: Chevron/Ian Allen, 2007. ISBN 1-90322-371-7. PZL P.11 Pictures and PZL P.11 for Sale.